Yesterday afternoon I made this LO of Zander with his favourite stuffed animal called Johnny. I bought this dog for him when he was 2 years old. We went to Switzerland during the summer of 1996 to visit some friends who lived near the lake of Geneva. They had this big friendly dog called Johnny and Zander really loved that dog. 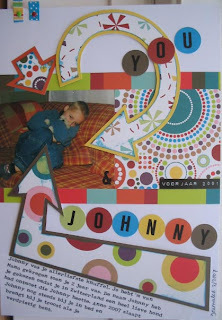 I'll soon make a LO with some of the photos I took from Zander and Johnny to show you. So, when we returned home and went to Assen to do some shopping Zander saw this stuffed animal and said to me: Mama, Johnny! He hold the stuffed animal in his arms and cuddled it. It was so cute I couldn't resist buying it for him. And it's good I did, because after having him for 10 years Johnny still is his favourite stuffed animal! Supplies: pp American Crafts, cardstock (Action), ribbon (American Crafts), brads (OTC), font typewriter (internet 1001fonts), distress ink china blue, dymotape, letter rub-ons (market).